Our company was founded February 24, 1896 as the "Grayson County Farmers Mutual Benevolent Fire Insurance Company". According to the original charter, the founding members included: Eli Hale, John M. McLean, Hardin Cox, James D. Perkins, and George W. Gilham. Our company was originally authorized to write only fire and lightning coverage in Grayson and Carroll Counties in southwest Virginia. In the early years, operations were carried out by the secretary/treasurer, elected by the board, from his place of residence. From early documents, it is not clear who the secretary/treasurer was from 1896 until 1928. In 1928, John I. Paisley was elected secretary/treasurer. Under his leadership, in that same year, operations of the company were moved to a rented office on Grayson Street in Galax, Virginia. Early documents are unclear on the date, but sometime between the original charter date of 1896 and November 1961, our company changed its name from the "Grayson County Farmers Mutual Benevolent Fire Insurance Company" to the "Grayson and Carroll Mutual Fire Insurance Company". On November 21, 1961, the charter was again amended, and the name was changed to the "Grayson-Carroll Mutual Fire Insurance Company". Along with the name change, our company was also granted the authority to write business throughout the Commonwealth of Virginia and to write, along with fire and lightning coverage, miscellaneous property insurance when such insurance was issued as a supplemental contract in connection with a fire insurance policy. This amendment was approved by the policyholders on January 6, 1962. In 1968, after serving in the capacity of secretary/treasurer for forty years, John Paisley stepped down. In his place, the Board elected Victor Halsey. In 1970, the Board of Directors determined it would be economically beneficial for the company to own its office quarters instead of renting as the company had done since 1928. In that same year, our company purchased a lot on Washington Street in Galax, Virginia and began construction of its own office building. The building was completed and our company moved its operations to this building before the end of the year. Documents are unclear, but sometime around this same year, 1970, the company became authorized to write the Section I portion of homeowners policies. In order to write the Section II portion, the company entered an agreement with Southern Mutual Insurance Company to fully reinsure the Section II exposure. Also, in 1970, Victor Halsey stepped down as secretary/treasurer. Mrs. Virginia Higgins was elected to fill the role. In 1977, the Farmers Mutual Fire Insurance Association of Wythe County, Inc. was merged into Grayson-Carroll Mutual Fire Insurance Company. 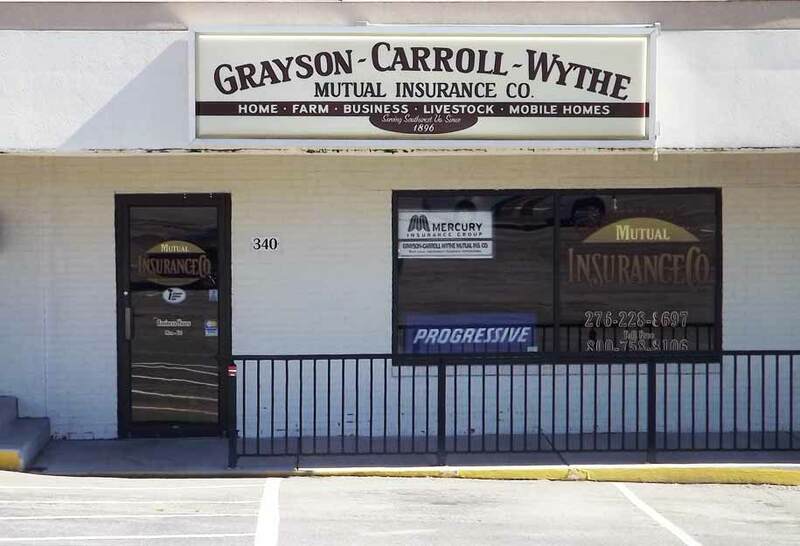 As a result of this merger, the charter was again amended to change the company name to "Grayson-Carroll-Wythe Mutual Insurance Company". 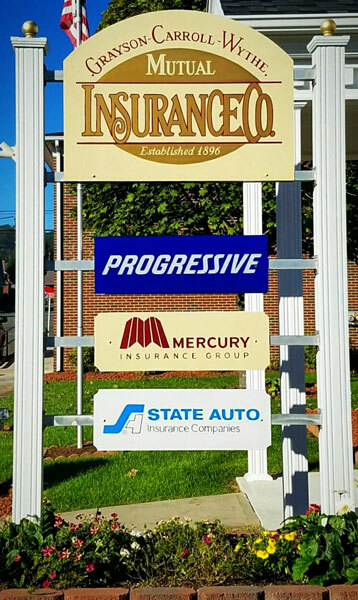 As part of the merger agreement, the office of the Farmers Mutual Fire Insurance Association of Wythe County, Inc. located in Wytheville, Virginia continued operating as a branch of Grayson-Carroll-Wythe Mutual Insurance Company. That office is still in operation today. In 1981, Mrs. Virginia Higgins stepped down as secretary/treasurer. Joe R. Liddle was elected to serve in that capacity and is still serving in that capacity today. Sometime around 1982, our company became authorized to write and retain Section II coverage on the homeowners policy and other personal liability and commercial liability coverage. As a result of this occurrence, the company started expanding the types of policies and coverages it offered to its policyholders. In 1983, a building lot became available for sale immediately beside the office building on Washington Street. As a result of almost ninety years growth and the growth spurt ignited by the merger with the Farmers Mutual Fire Insurance Association of Wythe County, Inc. our company was growing out of the space provided by the office building constructed in 1970. The Board of Directors determined it would be a good opportunity for the company to purchase this lot in order to construct another larger, more aesthetically pleasing, and more efficient office building in order to provide more room for future growth of the company. The purchase was made in February 1983 and construction on a new office building began immediately. The new office was completed and occupied by late summer and is still in use by the company today. In 1986, our company made its first investment in computer technology. In that year, the company purchased one computer and installed an automated, DOS based billing system. Prior to this, all billing was handled manually. In December 1992, the Mutual Fire Insurance Company of Bland County was merged into Grayson-Carroll-Wythe Mutual Fire Insurance Company. This merger resulted in no significant changes to the company charter. In 1997, our company opened an insurance agency. In order to offer complete insurance services to our local customers for those lines of business our company is not authorized to write, our Board and management determined an insurance agency representing other companies offering lines of business most requested would be beneficial. The first line of business written by our agency was automobiles. In the years since, we have added flood and life insurance. As the company continued to grow, we became subject to ever increasing regulation. In 2007, the Virginia Bureau of Insurance required the company to begin filing its annual report in conformance with the NAIC Annual Statement using industry accepted Statutory Accounting Principles. This became a challenge as the company had, until this time, always used a simple cash basis accounting system. As a result of these new requirements, the Board made the decision to prepare for and actively pursue more growth. To prepare for growth meant investing in more technology and expertise. In 2007, our company purchased new state-of-the-art software to help in preparation of the NAIC Annual Statement. In June 2008, the company hired two new employees to handle the new accounting and reporting requirements. The first is a CPA and the second has 25 years experience in insurance accounting, marketing, and information systems management. In October 2008, our company acquired its first fully automated policy management system. In late 2008, our company purchased a new automated accounting system. After making these investments in technology and personal, the company then began recruiting independent agents to represent them in the marketplace. The first independent agency was appointed in June 2010. As of November 2018, the company is now represented by more than seventy independent agencies in more than eighty-five different locations. More than two hundred individual producers are now licensed by the company. The growth brought about by penetrating the independent agency market has allowed the company to more than double its sales in the eight years since 2010. With this growth came the need to increase staff. In 2018, the company hired an IT Specialist as well as an Administrative Assistant. It is our goal to grow stronger for our policyholders. With these recent additional investments in our staff, technology and independent agencies we can.